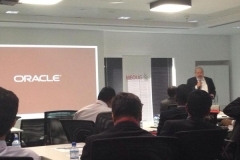 MEOUG provides a variety of opportunities to learn about current and upcoming Oracle technologies. MEOUG offers networking opportunities through the trainings and events we sponsor; we also encourage online interaction through our website available to our members. Join in discussions related to Oracle products, strategic direction, and staffing or post your own discussion topic to obtain the benefit of the collective knowledge and experience of the MEOUG community. The members-only section of MEOUG web site includes technical documents, articles and presentations. Moreover, MEOUG members often receive discounts on training.